Back in computing’s “Stone Age” – off you went to a system builder – chose your components, and then – you waited 48 hours or more for delivery, while the vendor “burned-in” the system. The purpose being; to avoid component failure at a later date. To help you to stay clear of hardware failure (which could leave you hanging), it’s a good idea to stress test your system/s from time to time. Better to be aware of impending hardware failure now, than to face the consequences later. BurnInTest (latest release December 12, 2011), is a terrific software tool for both Windows and Linux, which allows all the major hardware systems, and sub-systems of your computer to be simultaneously tested for stability, and reliability. 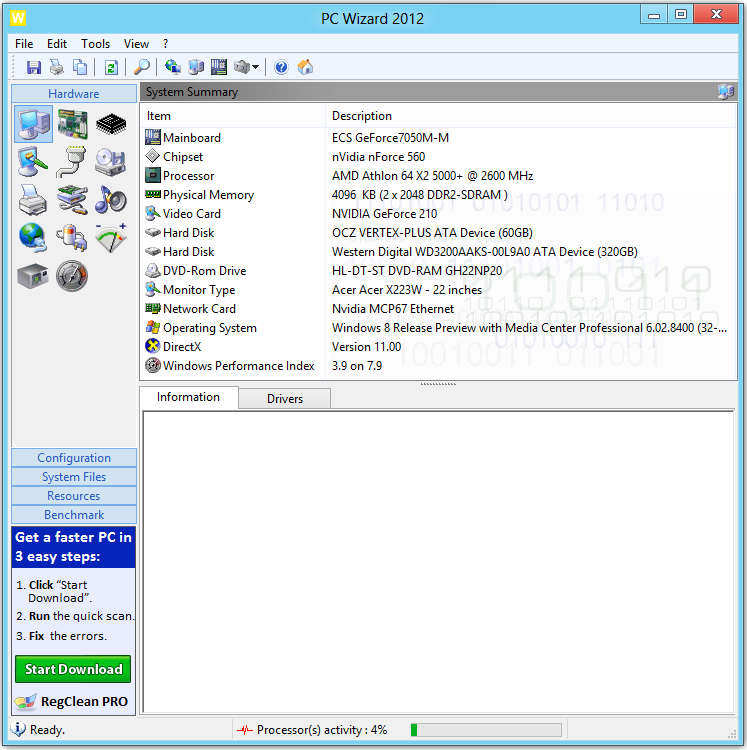 This menu driven application tests the CPU, RAM, disk drives, optical drives, sound cards, 2D graphics, 3D graphics, video playback, network connections and printers. This can all be done simultaneously, in approximately 15 minutes. The version tested here, was the fully functional 30 day trial version, (no restrictions). 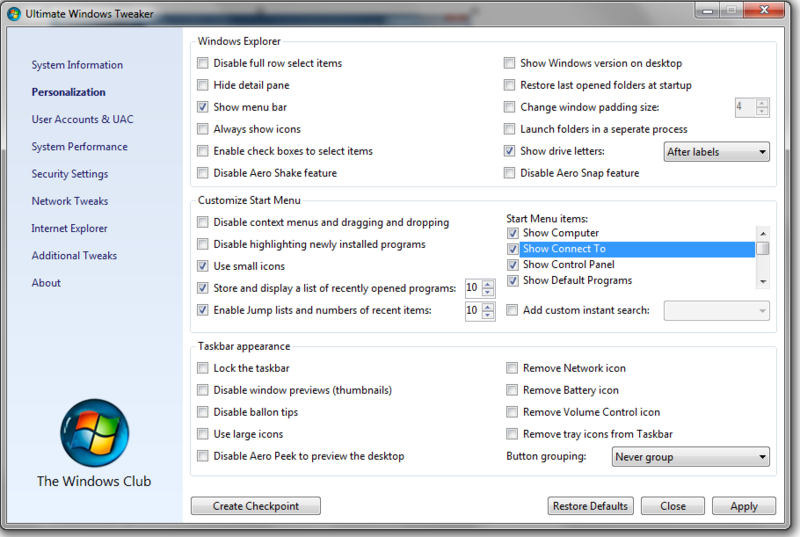 The preference screen, as the following screen capture indicates, allows for considerably test customization. Far too many to go into in this short review. You have the option of running selected tests as per the following screen capture…..
or, running a block of tests as per the following. A main test screen, as well as additional screens for each system test and sub test, allows you to view detailed scans in progress. Test completion. You’ll notice in the following screen shot that an error is reported on the Optical disc portion of the test. This was a deliberate choice on my part (no disc inserted in the drive). 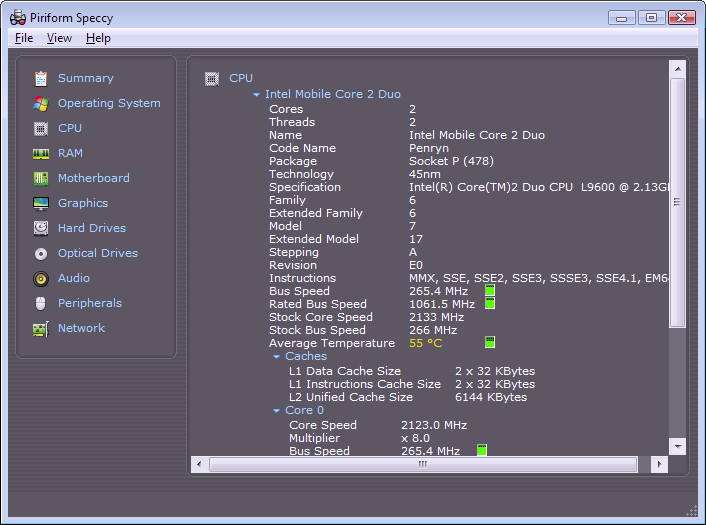 Since excessive heat is a hardware killer – in this test, I paid particular attention to the temperature of the graphics card. 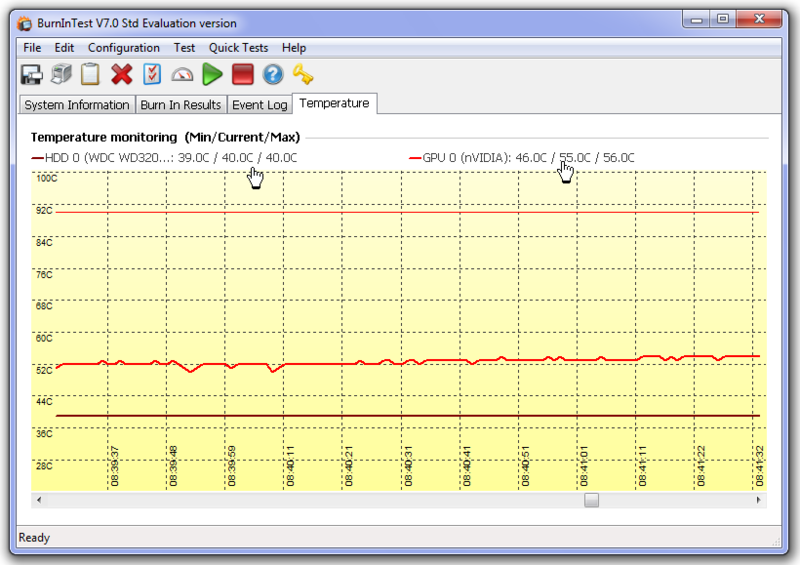 A graphics card under heavy load – and, this test suite lays on the graphic load – can run – hot – hot – hot! 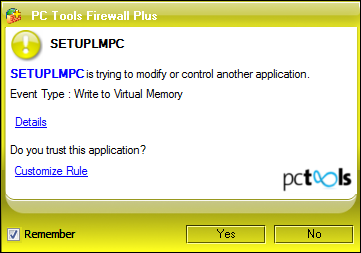 Test the stability of a system after configuration changes or hardware upgrades (critical for over clocking). 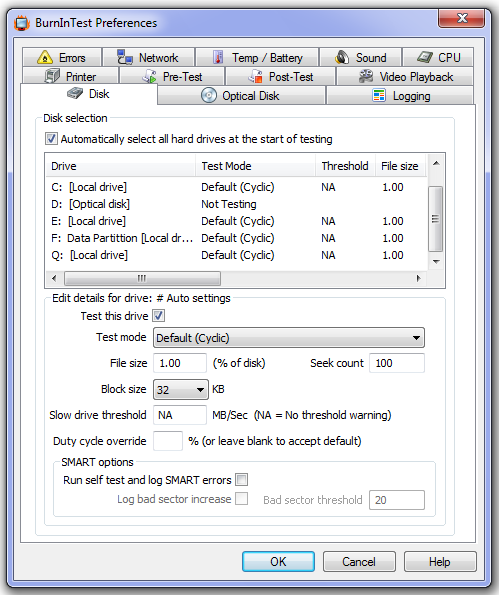 Results can be saved to disk, printed, or exported as a graphical image. Windows: Windows 2008 Server, Vista, Win 7, 2003 Server, XP, 2000. (32-bit and 64-bit platforms). 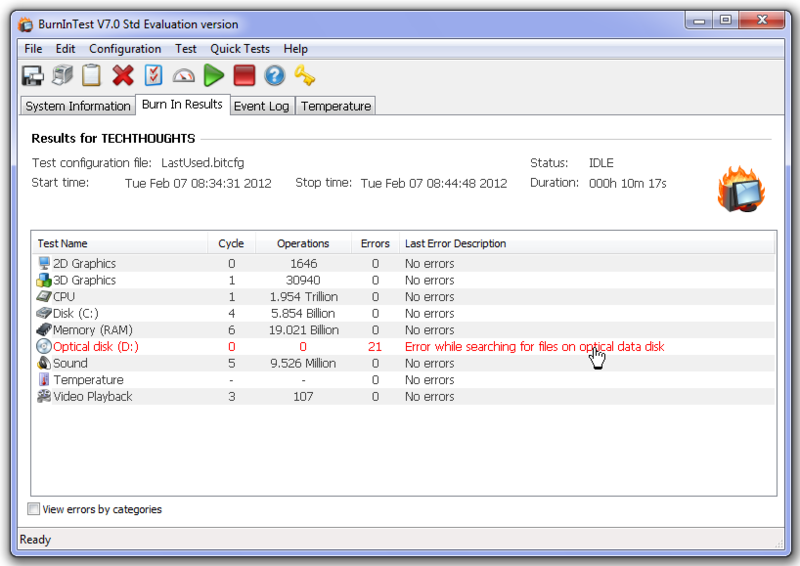 Note: The download refers to the 30 day fully functional evaluation version. If you think developing information on your computer’s operating system and hardware is a tough task, you can relax. 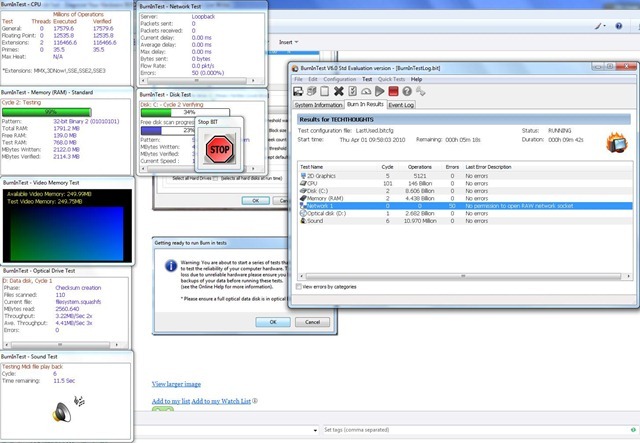 Here are 6 small, free applications, that make it easy to probe your computer system and create a detailed profile which can include hardware, installed software – motherboard, CPU and GPU specs – remaining drive space, and your operating system security hotfixes. System Requirements: Windows 7, Vista, 2003, XP, 2000, NT 4, Me, 98, and 95. 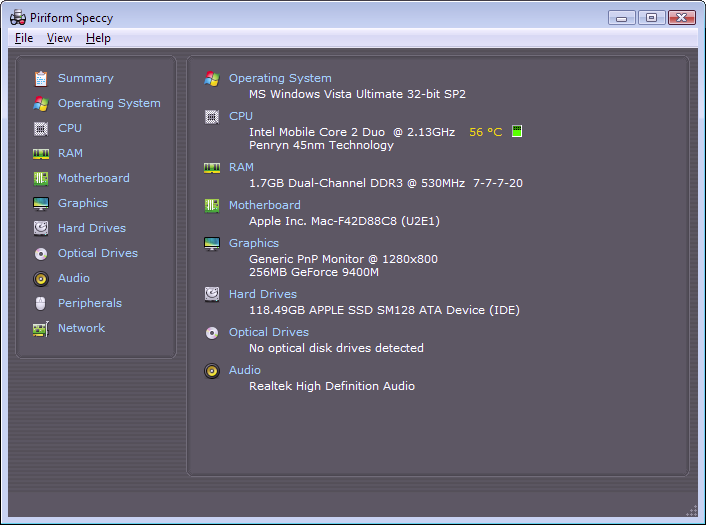 Both 32-bit and 64-bit Windows support. The results are displayed in your Web Browser in a formatted HTML report. The report is clearly formatted for ease of understanding and divided into appropriate categories. Hyperlinks within the report allow you to quickly search for additional information. As well, the report can be zipped, and then forwarded as an email attachment to your favorite “tech support” person. System requirements: Windows 2000, XP, 2003/8, Vista and Windows 7. 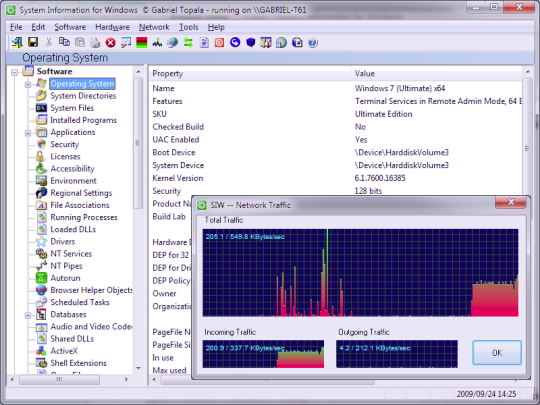 SIW is an advanced System Information for Windows tool that analyzes your computer and gathers detailed information about system properties and settings and displays it in a very comprehensive manner. 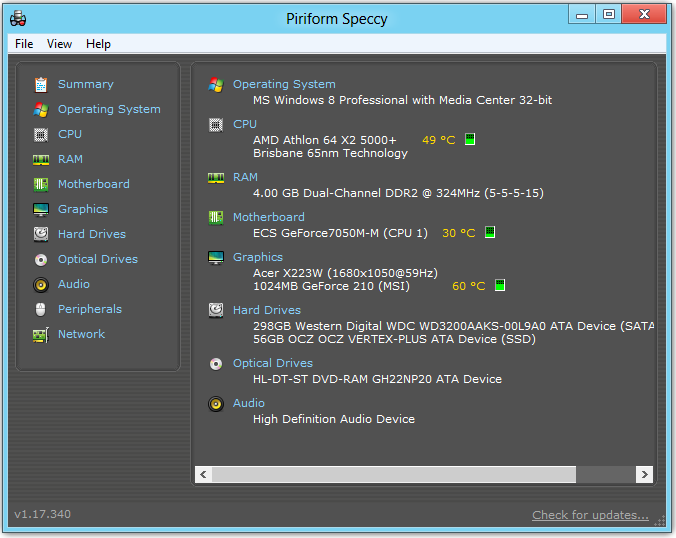 Speccy is not quite as comprehensive as the applications described previously. 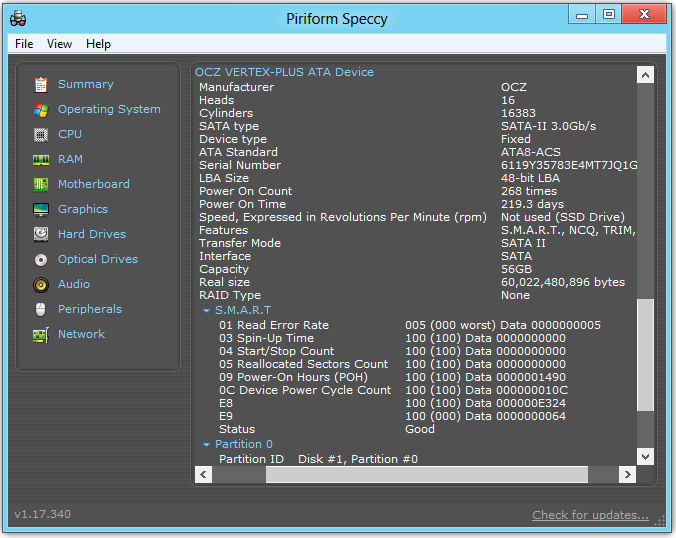 Even so, you can count on this free application to provide you with detailed statistics on every piece of hardware in your computer. Including CPU, Motherboard, RAM, Graphics Cards, Hard Disks, Optical Drives, Audio support. 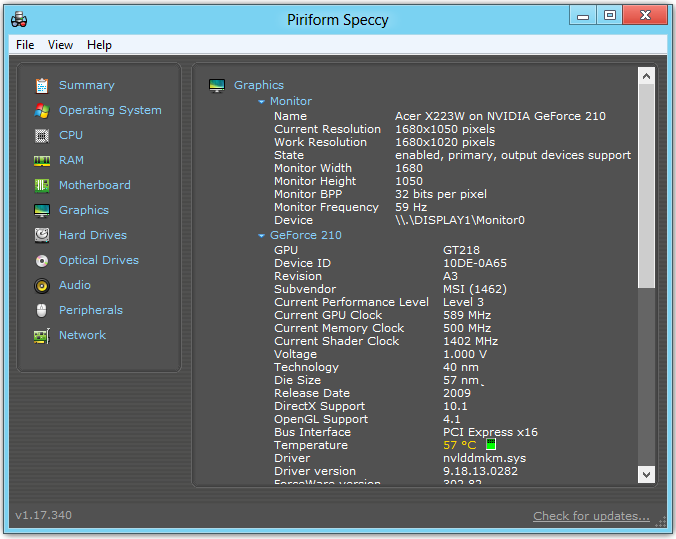 Additionally Speccy adds the temperatures of your different components, so you can easily see if there’s a problem. I haven’t personally tested this one, but you can read a review of this free computer audit application What’s really under the hood of that computer? on fellow Blogger Rick Robinette’s site. 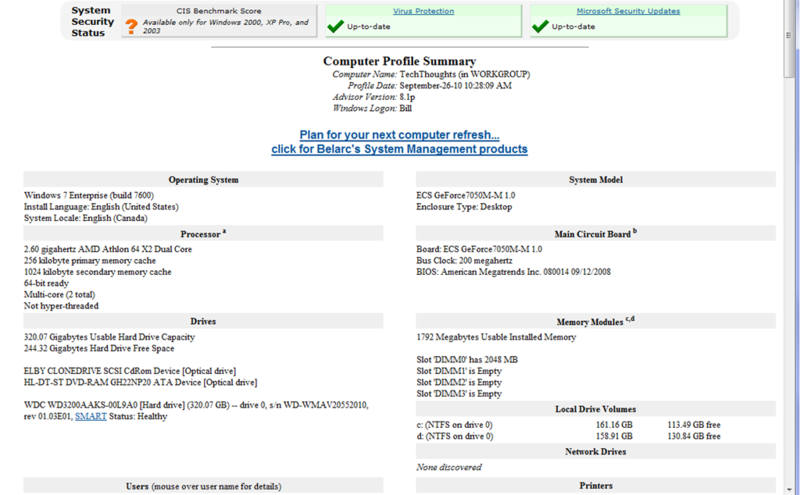 Do you have a detailed profile of your computer system which includes details on hardware and installed software? What do you know about your computer’s motherboard, CPU and GPU, remaining drive space, or your operating system’s security hotfixes? 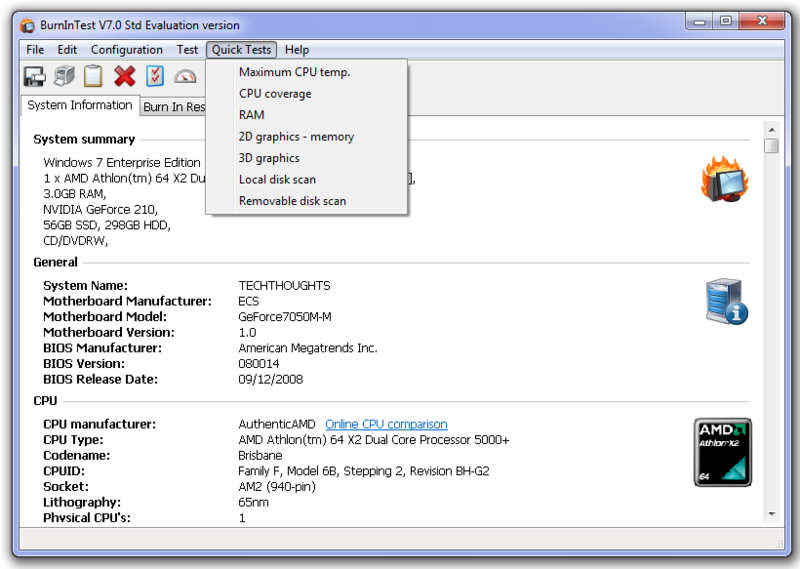 To effectively maintain your computer, and proactively deal with problems that may occur, you can make the diagnostic process much easier if you have specific and accurate details of your computer. If you need help from a computer support group, from a tech support line, or from a computer knowledgeable friend, you will need to provide specific and accurate details of your computer. 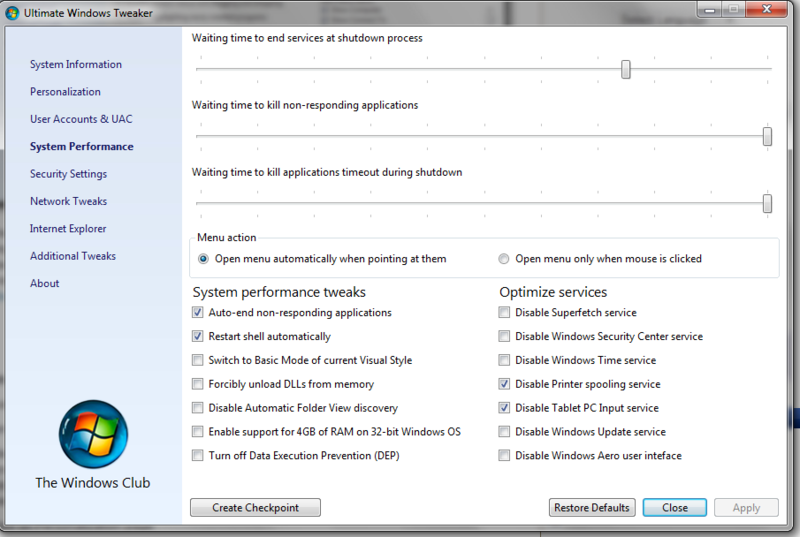 Without these details, it can be very difficult for even the most knowledgeable computer tech to be time efficient. 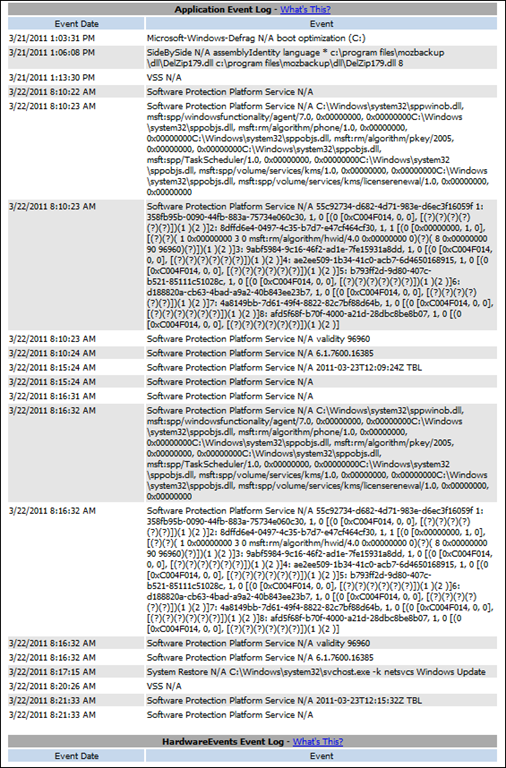 So it is important for you to create a detailed profile of your computer system before problems occur, and retain a printed copy of the report. Normally, creating such a profile can be very time intensive. But there are time saving solutions. 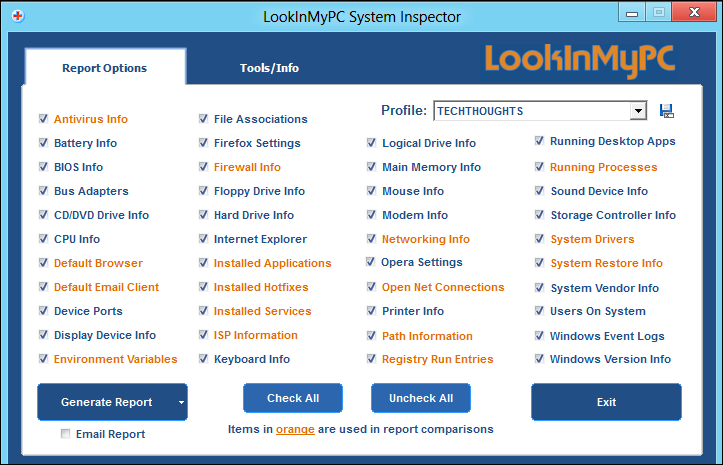 One such solution is LookInMyPC – a free program that automatically generates a detailed audit report of the hardware and software on your computer. It records essential information such as, operating system and processor details, the amount of RAM installed, drive specifications, and much, much, more. 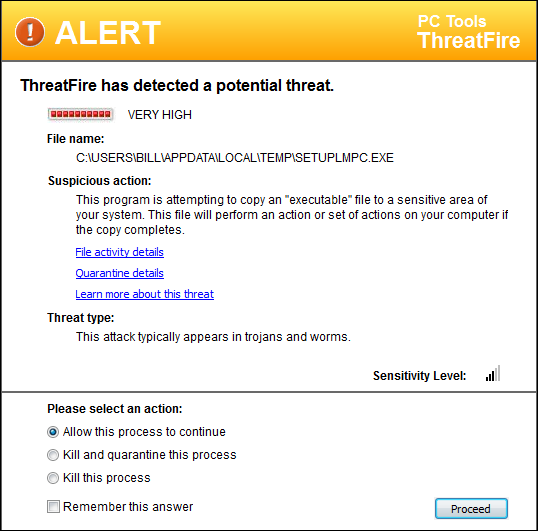 You may get one or more security warnings (as illustrated below), during the install, since this applications digs deep into the system. The graphic below indicates just how deep this application digs. But, in this portion of the report, the data shown is more complex and could be helpful (along with a huge amount of additional available data), in system diagnostics. 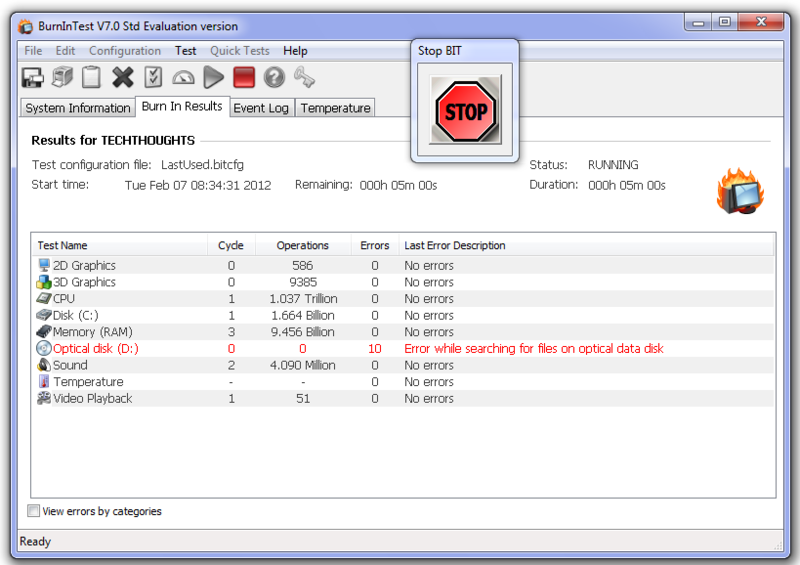 I have been using this program for some time, and find it invaluable for troubleshooting, and diagnostics. BurnInTest (latest release January 19, 2011 ), is a terrific software tool for both Windows and Linux, which allows all the major hardware sub-systems of your computer to be simultaneously tested for stability, and reliability. 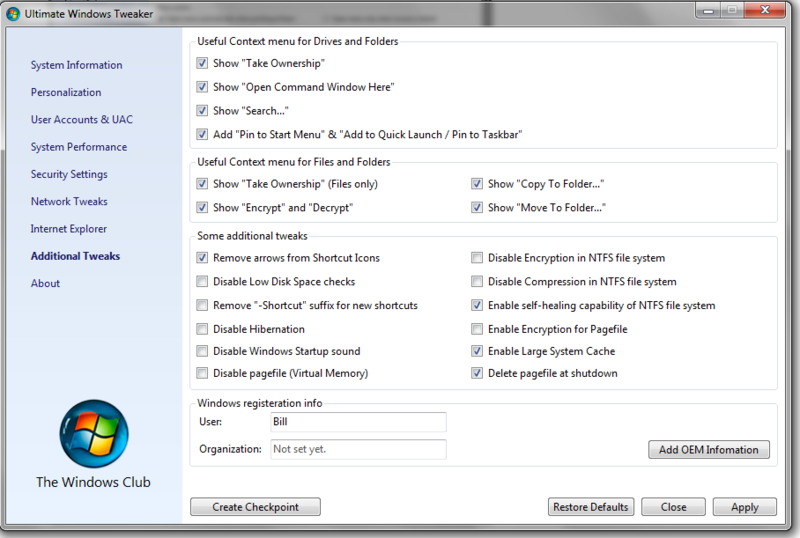 This menu driven application tests the CPU, RAM, disk drives, optical drives, sound cards, 2D graphics, 3D graphics, video playback, network connections and printers. This can all be done simultaneously, in approximately 15 minutes, and can be custom scripted for automated testing. Note: Free 30 day fully functional evaluation. Standard Edition: US$34, Professional Edition: US$69. 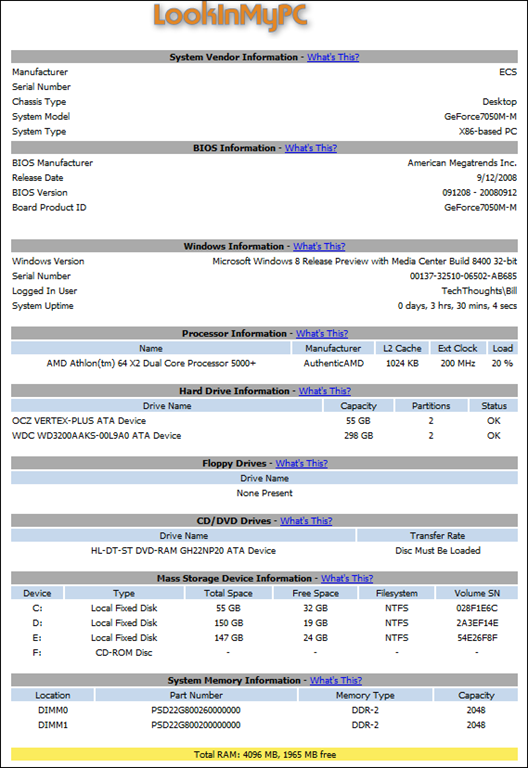 Do you have a detailed profile of your computer system including hardware and installed software? 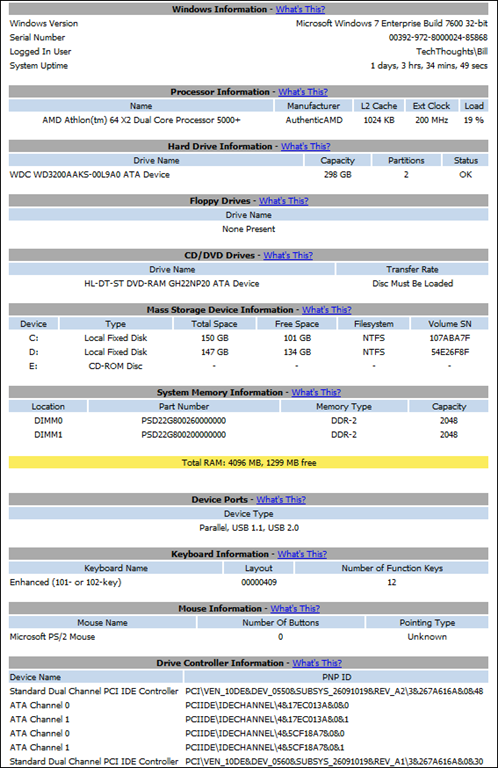 What do you know about your computer’s motherboard, CPU and GPU, remaining drive space, or your operating system security hotfixes? To effectively maintain your computer and proactively deal with problems that may occur, it is essential that you have as much information about your system as possible. 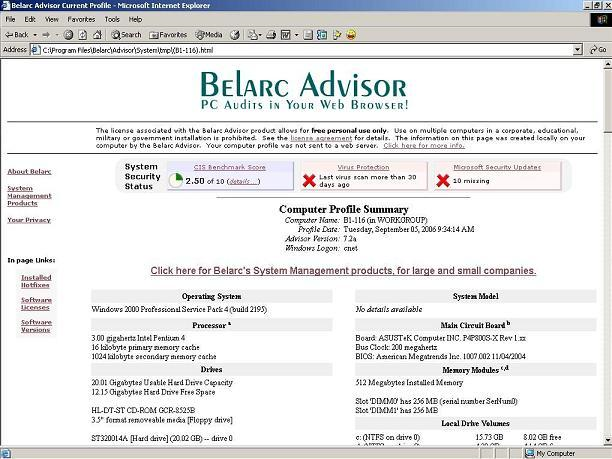 Belarc Advisor (last updated September 16), is a free program that automatically generates a detailed audit report of the hardware and software on your computer. It records essential information such as; operating system and processor details, the amount of RAM installed, drive specifications, and much, much more. The following screen capture shows only a very small portion of the audit report. I have been using this program for 5+ years and find it invaluable for troubleshooting, and diagnostics. Browser Requirements: Internet Explorer, Firefox, Safari, Opera, and many others. 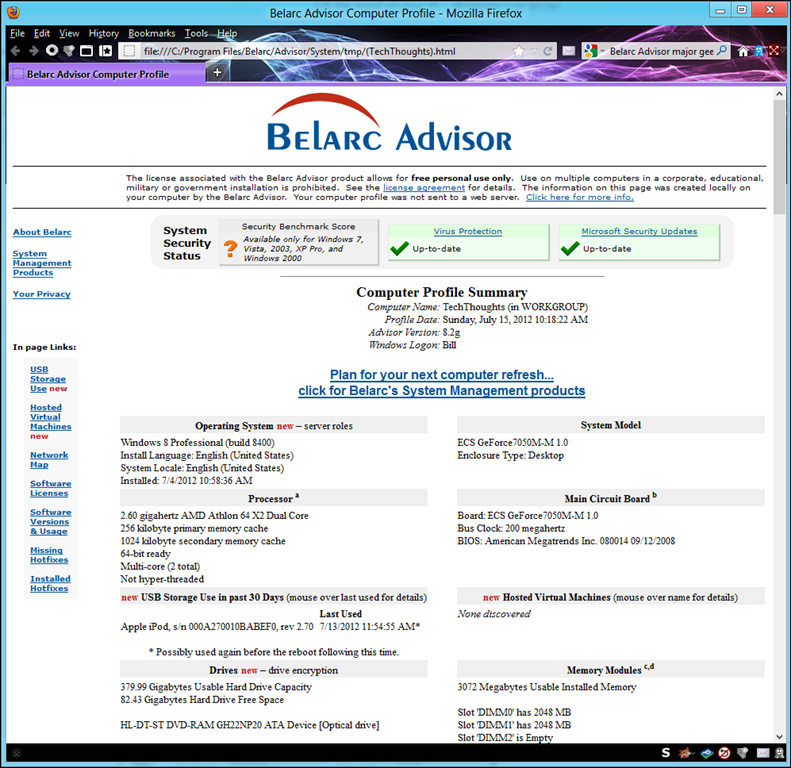 Belarc Advisor is free for personal use only.